What a FUN wedding this was! We just point out John Parker in the video so you know this is legit – LOL. As you can tell – this is not about US – its about YOU! Will YOUR wedding be THIS fun? 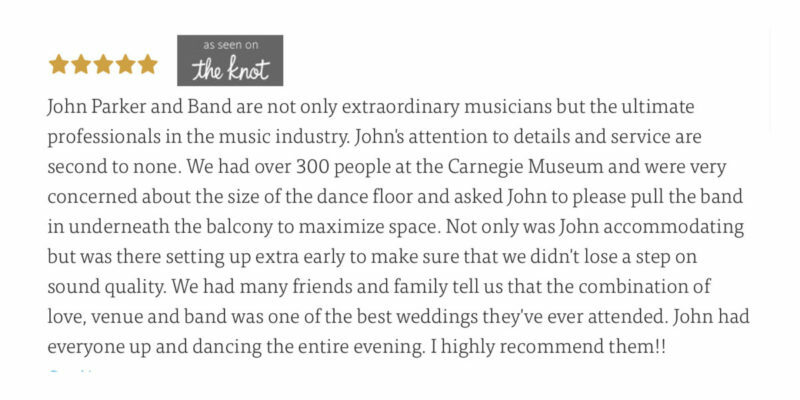 ••and here’s what they thought about us & our service..
our bands have done many 100’s of Pittsburgh Weddings & Events for over 20 years! Don’t take chances with YOUR Wedding or Party – Get the best, most reliable, and most professional live Pittsburgh bands for your event! Wedding Pictures are worth 1000 words! Longue Vue Club Pittsburgh • Old Fashioned Love!